Olympic gold medalist, Gabby Douglas has become a household name overnight. I was so excited when I found out I would be working with her. Armed with a HDX 900 I headed down to Virginia Beach for Dateline NBC. 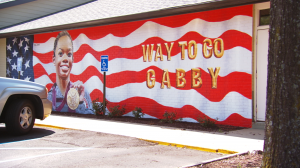 Mural of Gabby in her home town, Virginia Beach. I spent two days in Virginia Beach for Dateline. The first day I shot b-roll of a mural that was created in her honor, some exteriors of her home, and scenics of Virginia Beach. By the time I had finished with this it was time to head to the airport and catch her arrival home. It was nothing short of a chaotic welcome home as Gabby got off the plane. However, I managed to get shots of her getting off the plane and walking through the airport. We then shot a press conference with her at the airport. Afterwards we headed to a local hotel to cover a party that was being thrown in her honor. The second day we headed to the beach to catch Gabby being reunited with her two dogs after not seeing them for two years. It was such a cool moment to capture! We ended the day with shooting an interview on the Virginia Beach boardwalk. Once we wrapped I made a stop at my hotel and connected to the Wi-Fi so that I could email the transcription file of the interview to the producer in New York. Then I hit the road for Nashville. Gabby Douglas hangs out on the boardwalk for an interview.